The thing you must understand about True West – playing at the Young Centre for the Performing Arts – is that director Nancy Palk likes toying with her audience. That’s how Sam Shepherd’s play lures you in: frivolous comedy, throwaway gags, cheap shots between ill-assorted siblings, one of them straight-laced and the other a freewheeler. The lines are clever enough, but there’s a degree of contempt: wasn’t The Odd Couple in their 2011 season? What gives? And somewhere in the catwalk, you can just make out the director, cackling with glee as she prepares to throw the next one. Every inch of detail in this show has a clear dramatic purpose: there’s not a scrap of flab to be found. Shepherd’s script demands it, but it takes an actor-oriented company like Soulpepper to pull it off. Not only will your expectations be confounded, they will be yanked out of your body, shredded to bits, jammed into a toaster, and served back to you with a dollop of butter. And you’ll savour every bite. Ken MacDonald’s set–a suburban kitchen–is both wonderful on its own merits and extremely well-suited to this production. When the show begins, it seems impossibly vast, not unlike the desert about which we hear so much; by the end, it becomes tight, oppressive, and more than a little claustrophobic. This is no small feat, and the effect is astounding: one can hardly breathe for all the Tex-Mex kistch and commemorative spoons. Sam Shepherd’s Tony-nominated script is also outstanding: familiar enough to draw us in, while still retaining hard and incisive edges. The laughter leavens the darker elements so well that you may not even realize how utterly black the final scenes were until long after the applause has faded–and you won’t feel cheated for it, either. This sort of rethinking and revision is, after all, part of Nancy Palk’s pleasingly twisted spectacle. And the players in this universe more than meet the promise of the director, author and designers. Mike Ross and Stuart Hughes (as brothers Austin and Lee) play off–and with–each other so well that it’s scarcely worth dissecting their individual performances. The effect is that of two talented actors, thrilled to be be working together, excited about the project, and eager to squeeze as much joy and energy and enthusiasm out of the experience as they possibly can. They feel like siblings, inhabiting different universes but flung together by a cocktail of necessity and desperation, and neither Shepherd nor the audience could ask for nothing more. Their supporting cast are equally memorable. Patricia Hamilton’s Mom has the power to immediately revert her middle-aged sons to the feuding boys they remain in her eyes, while Ari Cohen’s Hollywood producer (Saul) practically levitates across the stage, buoyed by a combination of ego, other people’s money, and no small amount of hair gel. And it’s a testament to this cast that we neither miss them when they’re off-stage, nor resent their presence when they’re on: these performances have been nailed so perfectly that adding or removing a single line or piece of stage business would spoil the high. As it stands, they’re perfect. And that’s the story of this production. Palk has got herself an excellent script which also happens to be suited to her sensibilities, brought in some of our city’s best actors and designers, and churned out a production that lives up to every promise and ounce of potential contained within these elements. Perfect, perfect, perfect, perfect, perfect. True West is playing at the Young Centre for the Performing Arts (50 Tankhouse Lane) until May 5th, 2013. Performance times vary: see website for details. Tickets are $51-68 for adults, $32 for students. Tickets may be bought from the website, by telephone at 416-866-8666, or from the Young Centre box office. 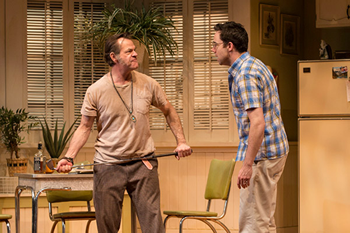 Be advised that Soulpepper shows routinely sell out: advance purchase is strongly advised. A limited number of rush tickets may be available at the venue before certain performances. See website for details. Photograph of Stuart Hughes and Mike Ross by Cylla von Tiedemann.